The students and teachers spend weeks preparing the homemade foods and baked goods – including 300 dozens of pierogies (varenyky) – to sell at the schools 's annual Christmas Bazaar to raise money for the school and its outreach. Working alongside their teachers, the students learned the value of a hard day’s work – and that cooperation comes first. 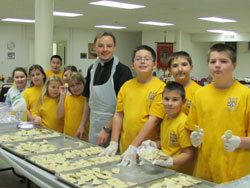 The Pierogies Project in always filled with love for our traditions and Church. A very special thanks to the members of the school FSA for putting in especially long hours assisting with all sorts of preparations leading up to the School Christmas Bazaar!